The ACTA Logo was designed by Marie Farrell rsm. 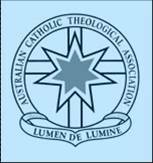 The motto "Lumen De Lumine" was suggested by Tony Kelly CSsR and accepted at the ACTA AGM in 1994. Symbols: Stars superimposed upon the Cross. The "outer" seven pointed star signifies Australia (as for example in the Australian flag, representing states and territories). The "inner" star represents the ministry of theologians within the Australian Church; "stippling" of the inner star is used to suggest the dynamic work of our theologians.